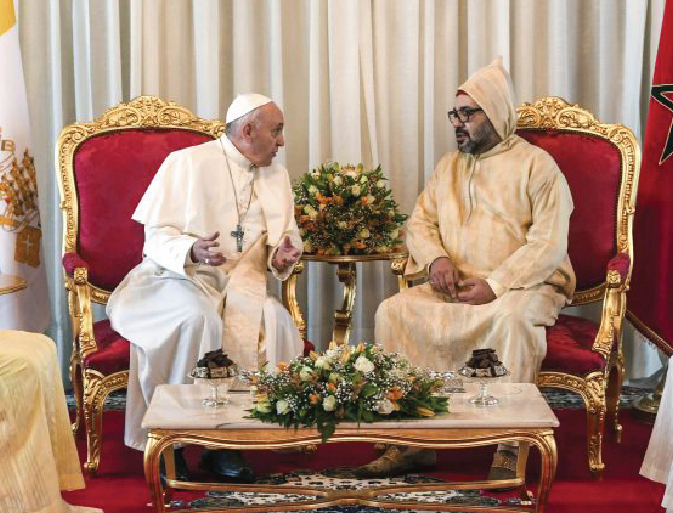 Pope Francis’s visited Morocco with the aim to highlight the North African nation’s tradition of Christian-Muslim ties while also letting him show solidarity with migrants at Europe’s door and tend to a tiny Catholic flock on the peripheries. The highlight of the trip in Morrocco was Francis’ visit Saturday to the Mohammed VI Institute, a school of learning for imams that epitomizes Morocco’s efforts to promote a moderate brand of Islam and export it via preachers to Africa, the Middle East and Europe. Pope Francis said on Saturday that Jerusalem should be a "symbol of peaceful coexistence" for Christians, Jews and Muslims, said a statement signed jointly by the pontiff and Morocco King Mohammed VI. The Pope said he considers it "important to preserve" the Holy City of Jerusalem "as the common patrimony of humanity and especially the followers of the three monotheistic religions, as a place of encounter and as a symbol of peaceful coexistence, where mutual respect and dialogue can be cultivated,” the statement, released by the Vatican said. The Moroccan king chairs a committee, created by Organisation of Islamic Cooperation, responsible for safeguarding and restoring Jerusalem's religious, cultural and architectural heritage. Palestinians see east Jerusalem, captured by Israel in the 1967 war, as the capital of a future independent state, while Israel sees the entire city as its capital. The decision angered the Muslim world and was seen as setback for Palestinian aspirations for statehood and an obstacle to the peace process in the region. Since then, other countries followed suit and said they would recognise Jerusalem as Israel's capital, including Romania and Honduras.